EXPRESSIONS of interest for more than $10 million in pest and weed control grants for drought-affected Queensland are being called for by the Palaszczuk Government. The grant monies include $5 million for cluster fencing to revitalise the sheep industry in long-term drought-affected areas plus an extra $500,000 for exclusion fencing. Agriculture Minister Bill Byrne said guidelines had been finalised by the Oversight Group, which included Wild Dog Fencing Commissioners Mark O’Brien and Vaughan Johnson, to deliver funding where it is most needed. “I’ve spoken with the commissioners and we agree it is important to get the maximum impact at the earliest opportunity. “That’s why $5 million in grants for cluster fencing to help revitalise the sheep industry will be committed by the government before Christmas,” he said. “I am aware that some landholders simply could not form clusters for various reasons and so today I am announcing an additional and separate $500,000 to assist them to build exclusion fencing. “This funding will be used to investigate and implement a pilot project looking at contingent loans for producers,” Mr Byrne said. Under the package $5 million will be available for cluster fencing in long-term drought affected areas, $1.84 million for community weed and pest animal management in rural areas and $1.9 million for industry and local government weed and pest animal management. “I’m also working with the Commonwealth Government to finalise details for a further $2 million to boost the weed and pest management initiative, focussing on drought-affected regions,” Mr Byrne said. “Cluster fencing funding, based on the South West NRM model, will be allocated to projects supporting regionally agreed cluster fencing arrangements in areas with high wild dog density and/or evidence of high impacts. 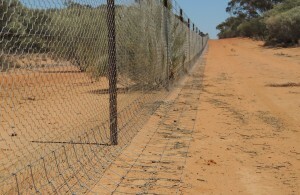 “Applications for the regional weed and pest animal management funding can complement cluster fencing arrangements in areas with high wild dog density and/or impacts, weed or pest animal control to protect the area’s assets,” he said. “The industry and local government pest component will be for projects that support and mentor landholders, such as through building skills and best practice management. Mr Byrne said natural resource management groups, local governments and industry organisations can apply for the grants. “Applicants will need to demonstrate they have developed projects through consultation with affected stakeholders, such as producers, community groups, Landcare and wild dog committees. “By adopting this coordinated approach we will ensure projects are fit for purpose, enduring, facilitate local employment and achieve the greatest impact,” he said. Project applications will close at 5pm on December 2, 2016. To apply for the Queensland Feral Pest Initiative grants, visit www.daf.qld.gov.au or call 13 25 23.